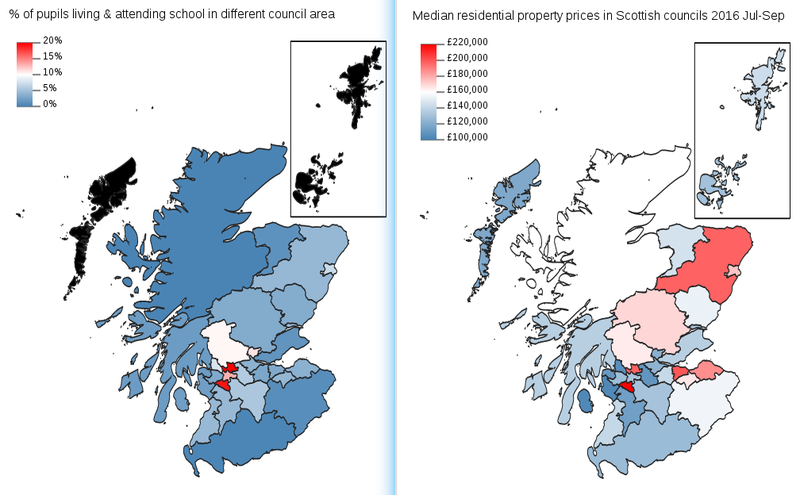 The previous post in this series found evidence of an association between inequality, as measured by property prices, and pupils attending schools outwith the council area they live in. This post will look at how this has changed in recent years in the Greater Glasgow hot-spot involving the councils areas of East Renfrewshire, East Dunbartonshire and Glasgow City. Glasgow City is never far from the national average: the black line and symbols sit on top of the green ones. About 4% or 1 in 25 secondary pupils in Glasgow schools live outside Glasgow. The two affluent suburbs of Glasgow are quite different, having percentages in 2016 that are close to 20% or 1 in 5 pupils. The percentage for East Renfrewshire has fallen slightly in the last year but the East Dunbartonshire percentage has climbed from 16% in 2011 to 20% in 2016. Now let's look at percentages of pupils who live in a local authority but attend a secondary school outwith it. As you might expect, the situation is reversed. About 13% or 1 in 8 secondary school pupils who live in Glasgow attend school elsewhere. For East Dunbartonshire this percentage has fallen to the national average in 2016 but East Renfrewshire remains well below it at about 1%. If we add together the numbers (not percentages) of secondary pupils in East Dunbartonshire and East Renfrewshire who live elsewhere then that comes to about 80% of the number who live in Glasgow but attend a secondary school outwith it. 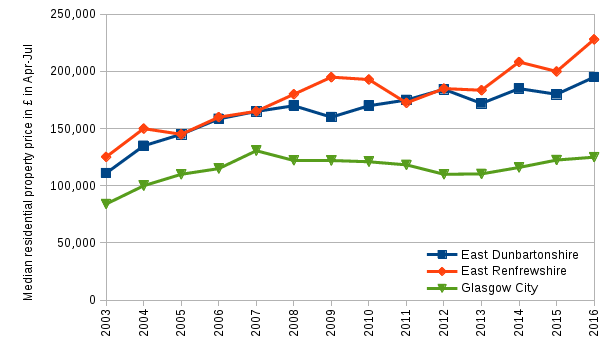 Further, the gently climbing trend for East Dunbartonshire in the first graph is consistent with Glasgow's slow rise in the second. Also, the dip in 2016 is also consistent with the drop for East Renfrewshire in the first graph. What we have here is clear evidence that points to what many people believe anecdotally: there are many parents in Glasgow who believe their children's education is better served by a school in one of these more affluent suburbs. But there's still a jump needed to reach this conclusion. Nothing in data presented thus far says why so many pupils living in Glasgow are going to school in East Dunbartonshire and East Renfrewshire. Also, the trends we can see above come from changes in numbers of secondary pupils in S1-S6 (all secondary years). If there's a change in admission policies in a particular year then that will mainly affect only S1 numbers. This means the effect will be much diluted in the S1-S6 total. In other words, the dip for East Renfrewshire in 2016 and the slow rise for East Dunbartonshire are likely under-emphasising changes in admissions of new pupils. There are a number of possible reasons for the flow of pupils from Glasgow to the suburbs. The most of obvious one involves the placing request system, but some of it will be due to exclusions and for other social or educational reasons. If placing requests are the main explanation and this is driven by parents believing, rightly or wrongly, that suburban schools offer a better education, then it is worth looking to see if there are accompanying trends in home prices. In contrast, although suburban price growth falters post-2008, the prices mostly stay above their 2007 values and there is still an overall upwards trend so that by 2016 the gap between Glasgow and its suburbs has grown substantially. The East Dunbartonshire median price grew from being 32% higher than Glasgow's in 2003 to 56% higher in 2016. The figures for East Renfrewshire are even larger being 49% in 2003 and 82% in 2016. (In this data set, East Renfrewshire and Shetland are the only two Scottish council areas that have seen a real terms growth in median home prices since 2007). The drop in East Dunbartonshire's and East Renfrewshire's prices between 2014 and 2015 (remember, both are for Q2 on this graph) is because the Scottish Land and Building Transaction Tax (LBTT) replaced Stamp Duty in Scotland from 1 April 2015, the start of 2015Q2. This had the effect of creating a spike in prices at the upper end of the housing market in 2015Q1, presumably because buyers hurried their purchases to avoid a tax increase caused by LBTT. For this reason, the 2015 value is anomalous but the jump in prices between 2014 and 2016 is believable. It's clear that housing in Glasgow's affluent suburbs has a premium relative to the city itself. It is also clear that this premium has significantly increased over the last 13 years. But how might that be linked with where pupils attend school? If parents perceive a school outside their council area offers a superior education and want to move their child to it then they have two choices: put in a placing request or move into that area. Of course, the latter choice will not be available to less well off parents. 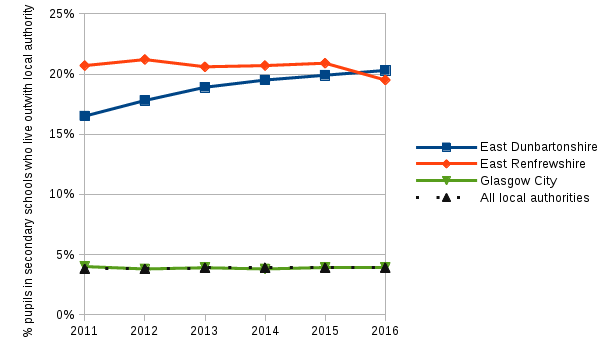 For East Dunbartonshire the above graphs provide evidence, albeit indirect, that suggests both methods have seen an increase between 2011 and 2016. The percentage of East Dunbartonshire pupils living elsewhere has increased from 16% to 20% and the premium on house prices rose from 48% to 56%. East Renfrewshire, however, saw a much larger rise in price premium over Glasgow, going from 46% in 2011 to 82% in 2016. In that time, the percentage of pupils residing outside the council area has fallen slightly which suggests that placing requests are being turned down. This would explain why the East Renfrewshire premium is so much higher than East Dunbartonshire: parents that are denied placing requests decide to move into the area, if they can afford it. "This year , 360 placing requests have been refused by the council out of a total of 531 submitted - an acceptance rate of just 32 per cent. Last year, just 185 were refused out of 543 giving an acceptance rate of 66 per cent." So, in summary, with the usual caveat that correlation does not imply causation, the trends in property prices are consistent with the explanation that a significant minority of parents in Glasgow are preferring to educate their children in suburban schools. You may be wondering why I have not yet looked at placing request data in this series of posts. The reason is simple enough: such data is no longer published by the Scottish Government. There was a detailed annual report on placing requests that was rigorous enough to have "National Statistics" status, but the last publication was in 2010 for the 2008-09 school year. I received a prompt response when emailing the relevant person in the Scottish Government to ask why publication had ceased and was pointed to the result of this consultation, and advised that the only way to get the data now was to ask each of the 32 councils individually. I was hoping to have my hands on more placing request data by the time I reached this third blog post, and I have found others who have trodden this path, such as the Sunday Post, but it seems that obtaining the data is going to take longer than I had anticipated and will likely involve some Freedom of Information requests. I will write more when I have the data. Until then, I'll leave you with a few thoughts on why investigating this issue matters. Firstly, people are very quick to express opinions on both education and inequality but much slower in providing evidence, and what evidence is proffered is often anecdotal. These blog posts are documenting my attempt to work through some evidence and clarify the assumptions needed to interpret something useful from it. Secondly, it is true that across most of Scotland there is no strong link between inequality and choice of (state) school. In fact, Greater Glasgow is the only clear example of it in Scotland, with the Clackmannanshire-Stirlingshire situation being explicable in terms of the location of Catholic schools. Usually, I would avoid dwelling on an exceptional or unusual case, but the effect we see in Greater Glasgow is revealed because it has the highest population density of anywhere in Scotland. In other words, the underlying problem of inequality's effect on education may well be more widespread but it only finds expression through parental choice in Greater Glasgow because schools in areas with contrasting demographics are so close to each other. Finally, as any teacher will tell you, their work and the resources available to them are only one part of a child's education. A large part of it depends on the parents and the aspirations of others around them, including competition within a pupil's peer group. So if a school is deemed to be under-performing, simply pouring resources into it is a mere whistle in the wind if the real problem is poverty in the community around it. 1. 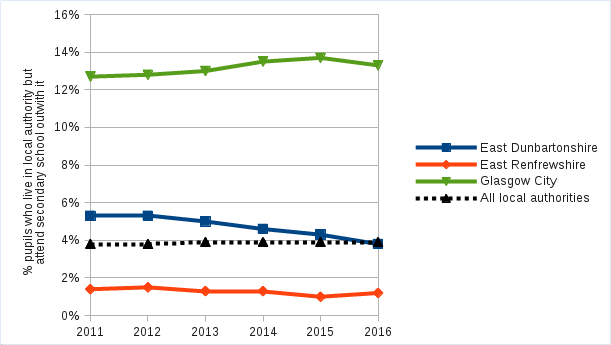 The first two graphs in this post are constructed from the supplementary data set for the 2016 pupil census which extends back to 2011, though an older report gives values for 2010. I've not included the 2010 data because they don't alter the trends significantly and also I wasn't sure if data from the different reports were comparable. A spreadsheet with all data and calculations will be provided in a future blog post. 2. 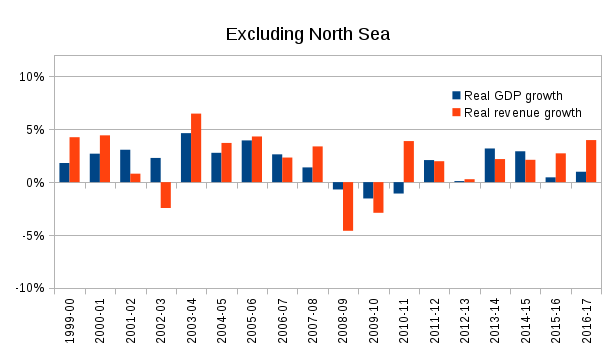 Quarterly house price data is taken from this publication from Registers of Scotland. Aggregating quarterly medians to form annual medians requires raw data that is not published in this release. Instead I chose to use only Q2 data (Apr-Jun) because it is the quarter that usually has the greatest number of property transactions. Concentrating on the same quarter of each year also avoids problems with the large seasonal variations seen in property sales data. In the last post we saw that Scotland has some high percentages of pupils living in one council area but attending secondary school in an adjacent area. There were two notable examples: pupils commuting from Glasgow to its leafy suburbs — East Dunbartonshire and East Renfrewshire — and also from Clackmannanshire to Stirlingshire. In this post we'll look at geographical associations that may yield clues as to what's behind this. You, like me, may have an intuition informed by anecdote about what's happening, but I'd encourage you to put that aside for the time being because the point of this series of posts is to let the data speak for itself and step carefully through quantitative evidence. First, let's take a look at the population densities of councils, shown on the map below on the right. The population density is the number of people living in a council divided by its area in square kilometres (sq km). The left-hand map is the one from the last post (with a few visual improvements). Click to enlarge. Council names are omitted for clarity, but you can see them on this map. At first glance they seem quite similar. Population density is low across Scotland and, in most places, 90% or more of pupils attend a school in the council area where they live. Both maps have hot spots around Glasgow which has the country's highest population density (3521 people/sq km). But, population density cannot be the only factor involved. East Dunbartonshire (616 people/sq km) and East Renfrewshire (538 people /sq km) do not seem much different to Glasgow's other neighbours: Renfrewshire (673 people /sq km), West Dunbartonshire (566 people /sq km) or North Lanarkshire (722 people /sq km). Only semi-rural South Lanarkshire stands out as having a significantly different population density (179 people /sq km). Also, although Edinburgh (1926 people /sq km) has a lower population density than Glasgow, it is still very high relative to its neighbours, West Lothian (421 people /sq km), Fife (279 people /sq km) and Midlothian (251 people /sq km), but there is much less movement of pupils across its city boundary than for Glasgow. 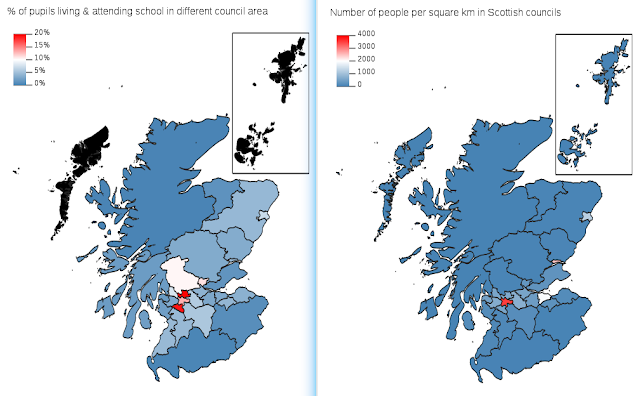 Nor does population density provide an obvious explanation for why there is a flow of pupils from Clackmannanshire (323 people /sq km) to Stirlingshire (43 people /sq km). Like Glasgow, it is from a high population density area to a low one, but there are several other pairs of adjacent areas where this is the case but there is no flow. Scotland's overall population density is 69 people/sq km and so all the councils mentioned above, apart from Stirlingshire, are relatively densely populated. At the other end of the scale, the lowest mainland population densities are the Highland council area at 9 people/sq km and Argyll & Bute at 13 people/sq km. With this in mind, and being careful not to speculate too far beyond what the data is telling us, the most we can say is that high percentages of pupils commuting across council boundaries occur where population density is high, but population density alone cannot be used to predict it. Home prices offer a measure of the affluence of an area because they reflect both wealth and, through mortgages, income levels. The map on the left is again the one from the previous post, but the one on the right now shows the median residential property price for each council in Scotland: half of properties cost more than the median price, half less. Now we can see that East Dunbartonshire and East Renfrewshire stand out as the most affluent areas in Greater Glasgow. This is, of course, no surprise. And the differences are not small — median home prices for both these suburbs are double that for North Lanarkshire. This contrasts with the situation around Edinburgh where there is less of a difference between the city and its neighbouring councils, which are also significantly lower in population density than those around Glasgow. It's also clear that Clackmannanshire is less affluent than Stirlingshire and, as with Glasgow and its leafy suburbs, there is a flow of pupils towards the more affluent area. We can tentatively conclude that given a sufficiently high population density, which is actually a proxy for schools being close to one another, then there is a draw for pupils living in poorer areas to attend school in a nearby wealthier area. And this draw seems larger for greater differences in affluence, at least as measured by home prices. But this association is incomplete, because it would also predict that pupils living in Clackmannanshire should be drawn to schools in neighbouring Perth & Kinross which is slightly more affluent than Stirlingshire. In other words, why do so many pupils residing in Clackmannanshire go to Stirlingshire instead of Perth & Kinross? The most likely explanation is that Clackmannanshire has no Catholic secondary school and St Modan's in the city of Stirling is considerably closer than those in Perth (see this map with council boundaries turned on). So, in summary, there does seem to be an association between wealth and/or income inequality in high population density areas and the choice of which schools children attend. Other local factors, such as faith schooling, can be important too. No doubt there will also be an effect for private (i.e. non-state funded) schools but these are not included in data considered here. But I'd urge caution in that we have only found associations, not causes. We cannot say whether it is a pre-existing difference in affluence that somehow creates a social incentive for parents to send their children to other councils for their education, or if it is the perceived standing of certain schools that is pushing up house prices and increasing the affluence of certain areas. Showing causation rather than correlation is more difficult, but the next post may yield some clues on this point by looking at recent trends in the data. This is the first in a series of posts looking at placing requests and what, if anything, they can tell us about how educational inequality varies across Scotland. In a return to what was the original format on this blog, I'm going to keep posts short and focused with only one or two graphs or tables per post. It would be a rare child that would ask "how do I get the most out of the life ahead of me?" The answer that well-meaning adults would give, and often do give even without being asked, is "work hard". But if we were being more honest we'd say "Work hard, but first make sure you were born in the right place, with the right parents." With this in mind, one way to assess educational inequality is to look at how parents choose to educate their children and how this varies across the country. The hottest spot is around Glasgow, though all urban areas around Edinburgh, Stirling, Aberdeen and Dundee show elevated levels. Rural areas, such as the Highlands and Dumfries & Galloway and the Borders, show the lowest levels. No data is published for the Western Isles, Orkney and Shetland (coloured black) which, according to a note in the source data, is to "prevent disclosure", which I presume means that the numbers involved are so small that individual pupils could be identified. The table below shows more detail for the top 10 hotspots shown on the map. The first pair of coloured columns shows the percentage of pupils who live in that council area but attend a school in another council area. The second pair of columns show the percentage of pupils who attend school in that council area but live outside it. 1.5% of primary school pupils living in East Dunbartonshire attend a school that is not in East Dunbartonshire . 10.5% of pupils attending a secondary school in Stirlingshire live outside Stirlingshire. The "Max" column shows the maximum for that row. This is used to order the rows in the table and also to colour the map. The first is that the percentages are higher for secondary schools than for primary schools. This is presumably because secondary school pupils can travel further from home to school and perhaps also because the choice of secondary school is more crucial to parents. The second is that the affluent Glasgow suburbs of East Dunbartonshire and East Renfrewhire top the table with about 1 in 5 secondary pupils coming from elsewhere. Glasgow City is third with about 1 in 8 secondary pupils residing there but attending school outside Glasgow. It is of course not a coincidence that these council areas are next to each other. Stirling and Clackmannanshire are similar in that they are neighbouring and have high but opposite percentages for secondary schools. In summary, we have found some clear patterns in this data. Specifically, it seems that parents in Glasgow are sending their children to suburban schools, with a similar but smaller effect from Clackmannanshire to Stirling. In subsequent posts I'll look at this in more detail and see what it can tell us about inequality in education. In the next post I'll look more closely at the main hot-spot around Glasgow. 1. The data used to construct the above map and table are for 2016 and were taken from the supplementary data set for the 2016 pupil census. A spreadsheet with all data and calculations will be provided in a future blog post. I was hoping to move on from the economy and look at a pile of education-related stuff, but one aspect of this year's GERS report caught my attention. Rather than shoe-horn anything further into the last post I thought I'd write this fresh post. 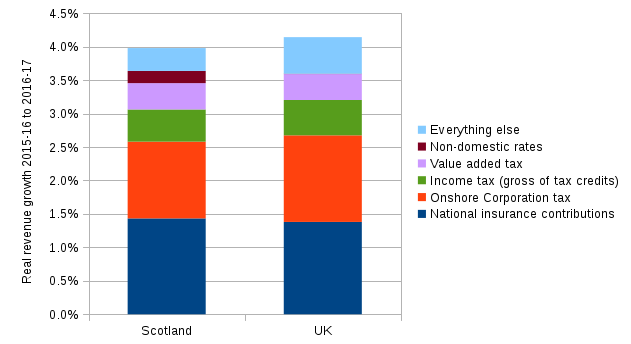 In the previous post I noted that Scotland's onshore GDP grew by 1.0% whereas onshore revenue grew by 4.0%. In this post I'd like to explore why these two numbers are so different. The issue is this: if our economy is sluggish in producing more stuff, how can more taxes be generated from our earnings (income tax and national insurance), profits (corporation tax) and shopping expeditions (VAT)? First of all, let's give the question a bit of context by looking at the history of growth rates for GDP and revenue (Table S.1 from GERS with inflation correction using HM Treasury deflators). 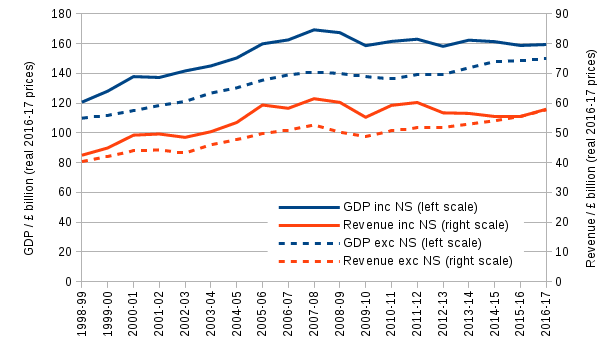 As you can see the last couple of years are quite unusual, with only 1999-00 and 2007-08 showing similarly low GDP growth and high revenue growth. The year of the great financial crisis is not exactly a precedent we'd wish to follow, but let's not jump to any conclusions. The next step is to see how different taxes contributed to the rise in revenue. To do this I've broken down the 4.0% rise into the individual taxes that contributed to it. Also, I've done the same for the 4.1% rise in UK revenues (which include the North Sea, though it's heavily diluted in the much larger UK economy). As you can see, Scotland and the UK's very similar percentage rises have very similar explanations. The only notable difference is that Non-domestic rates (levied by councils on business properties) contributes a small slice of growth in Scotland but next to none in the UK as a whole. So that gets us an important step forward, in that, barring extraordinary coincidences, the revenue growth is a UK-wide phenomenon, not peculiar to Scotland. Just under two-thirds of the revenue growth comes from National Insurance and Onshore corporation tax. This is odd because these taxes are quite unrelated. The former is essentially a tax on income and the latter is a tax on company profits. Also, if a rise in incomes caused the national insurance take to rise, why is the income tax rise relatively modest? Next, I went to the Quarterly National Accounts Scotland (QNAS) that were released on the same day as GERS, and looked to see if "Compensation of employees" (Table F) showed any impressive increase. Its real growth turned out to be a paltry 0.7% which ruled it out as the culprit. However, this leaves only one other place to look: the tax regime itself. A bit of web searching soon revealed that changes came into effect in April 2016 which caused National Insurance Contributions to rise, and it was regressive in that folk on lower incomes experienced larger rises in percentage terms. More than that, the Office of Budget Responsibility (OBR) forecasted a big rise in the flow of revenue to Government coffers as a result. This, plus a modest rise in incomes, evidenced by the green income tax bit in the bars above, can explain about half of the total revenue growth. there's been a crackdown on tax avoidance with some international cooperation, and the likes of the "Google tax"
and finally, company profits look healthy now because they're not investing in their businesses, which is likely storing trouble for the future. Another plausible reason is related to the final two points. Companies fear that any current boost to their profits may be temporary and business will get tougher due to Brexit in the years ahead. This makes them reluctant to raise wages now because they expect they would have to be lowered again in the near future, and lowering wages is harder than raising them. This explains why companies are holding onto their current gains but wage growth (see 0.7% mentioned above) is much lower. And with that we have now explained almost all of the growth in revenue. Of course, the National Insurance change is a one-off growth spurt, and although the corporation tax surge could well continue for a while, the effects of present weak investment and Brexit uncertainty lurk in the not-too-distant future. PS Thanks to George S. Gordon for a Twitter conversation that helped me get my head around this stuff. Edited 26/8/17 09.04 to fix typo and mention regressive nature of NI changes. Edited 8/9/17 09.38 to insert penultimate paragraph on poor wage growth relative to profits. GERS 2016-17 came out today. The headline figures show what most folk will have expected, namely Scotland's deficit (net fiscal balance) is still big at 8.3% though a bit improved on last year's 9.3%. Nevertheless, that's still 6 percentage points larger than UK's deficit of 2.4%. In this post I want to draw attention to some other interesting points you may not see elsewhere. This was written fairly quickly so please excuse any typos and expect a few (hopefully minor) revisions. The Government Expenditure & Revenue Scotland 2016-17 gives a summary of all public expenditure that benefits Scotland's residents, together with revenues raised from Scotland's people and businesses, mostly through tax. It covers the financial year from April 1 2016 to March 31 2017. In what follows I'll refer only to figures including a geographical share of Scotland's North Sea unless otherwise stated. References to specific parts of GERS are given in brackets where relevant. The deficit is most usually view as a problem and it would become one if Scotland had to fund it by itself. But putting that aside, you can view it as a positive for Scottish society, at least under current arrangements. Of course there are some caveats here. Firstly, an economy dependent on state spending may suffer from unhealthy distortions because too much economic power is wielded by one actor, in this case the government(s). Also, money that seems to be flowing into the Scottish private sector may not stay there if it, for example, goes to companies owned outside Scotland. And, of course, some of the expenditure will go directly to companies outside Scotland (e.g. a council buys a German bin lorry). The graph below shows the top 3 areas of expenditure adjusted for inflation using standard HM Treasury deflators to be in 2016-17 prices. Health and education are completely devolved to the Scottish Government and councils whereas Social protection is mostly reserved to the UK Government. 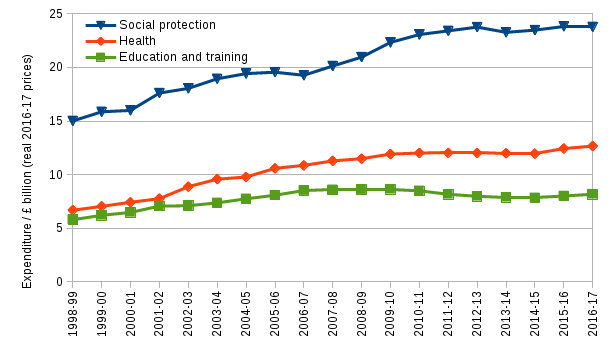 Social protection, at a third of all expenditure, is the largest single area of spending and includes welfare spending which is itself dominated by the state pension. Much of the rise in Social protection and Health can be explained by the extra demands placed on them as the post-World War 2 baby-boomers move into old age. In contrast, until 2014 the number of children in Scotland was decreasing. Despite that, spending on Education and training, which is dominated by school spending, was rising until 2007-08 after which it plateaued and fell. Numbers of children are now rising and Education and training spending has started to rise in the last couple of years but it still sits about £0.5 billion below its peak. The 'R' in GERS standard for revenue and it's mostly tax. More than half of revenue in 2016-17, and indeed in most years, was from the big 3 taxes that most of us pay: income tax and national insurance from what we earn, and VAT from what we buy. The graph below takes revenue values from GERS and GDP from the Quarterly National Accounts Scotland 2017Q1 which were released on the same day as GERS (with much less hoo-haa). I checked that the GDP implicit in the GERS report matches that published in the National Accounts. There's a lot going on in this graph, so look first at the solid lines which include a geographical share for the North Sea. The picture here is that both GDP and revenue peak in 2007-08 prior to the financial crisis and then plateaued or slightly decreased thereafter. GDP remained flat in the last couple of years whereas this year's GERS shows a noticeable uptick in revenues though it is still well below its 2007-08 peak. Now turn your attention to the dashed line which excludes the North Sea, often referred to as being for the onshore economy. Unlike the solid lines, both GDP and revenue have been growing since 2010-11 and we can see that all revenue growth in 2016-17 is due to the onshore economy (the solid and red lines merge). What's interesting here is that in 2016-17 the onshore economy's revenue increased in real terms by 4.0% whereas GDP increased by only 1.0%. Something similar is true for 2015-16 with its figures being 2.7% and 0.5% respectively. This is unusual though not unprecedented, but it's perhaps concerning that the last time this happened was in 2007-08. Without looking at other data it's hard to be sure what's going on here, or what its implications are, but it does make me wonder if it's a signal that the economy is in a peculiar state. That said, if we take a longer view and average over the last five years then the difference is much smaller: GDP grew on by 1.5% per year and revenue by 2.3%. What has the EU ever done for us? Or us for it? By many measures, Scotland is relatively well-off compared to much of the EU and most of the rest of the UK, e.g. by poverty rates Scotland is on a par with the southeast and east regions of England. This is why Scotland and the UK as a whole make net contributions to the EU. There are of course significant non-financial aspects of EU membership, but that's an issue for another blog post and not something that is the remit of GERS either. Hindsight is a marvellous thing, and one indication of the quality or uncertainty of annual statistics is whether they need substantial revision in subsequent years. Sometimes an error is uncovered, but more commonly improved data becomes available; gathering and processing data takes time. The third reason for changes is that accounting conventions change, and that is the dominant reason for revisions in this year's GERS. In what follows I refer to figures for 2012-13 to 2015-16 compared to figures given in last year's GERS report (2015-16). *Affects UK as a whole too. Cash vs accruals crops up a lot in GERS, especially within the "Accounting adjustments" category. With a cash accounting basis you date amounts according to when the cash moved from one account to another. With accruals you date it by when the reason for moving the cash was agreed. It is like the difference between the date an invoice was paid and when it was issued. You might be tempted to see how Scotland is doing relative to other countries. To account for economies of different sizes, this is usually done by comparing public expenditure and revenue as percentages of GDP using datasets such as those from the OECD. However, a word of warning. GERS is a rather unique report in that it's trying to give a fiscal picture of a country within a state (Scotland in the UK). As such it is likely to be difficult to compare it to other countries directly. In addition to that, different definitions of "public sector" and differing accounting conventions (cash vs accrual being one such example) can make comparison very tricky. If you really want to compare Scotland with other countries, then you can get some clues as to likely differences by comparing UK values first. For example, according to GERS the UK's 2015-16 (tax) revenue is 36.2% of GDP whereas the OECD 2015 figure is 32.5%. Notice that GERS uses the financial year whereas the OECD uses the calendar year. Edited 23/8/17 at 16.03 to fix a typo and tidy up wording of EU section. Edited 23/8/17 at 17.10 to correct garbled bit of spend and tax per person (thanks to @FraserWhyte for spotting it), and to add Expenditure top 3 section and graph. Edited 24/8/17 12.15 to add revenue section and graph and fix a couple more typos. There's not been a post here for a while as I've been otherwise occupied with assorted projects and personal stuff. Rest assured, normal service will be resumed. In the meantime you may want to take a look at a new book called A Nation Changed? 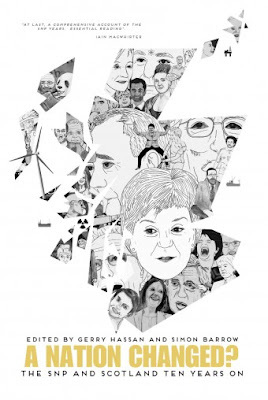 The SNP and Scotland Ten Years On edited by Gerry Hassan and Simon Barrow. It has over 40 chapters with each one written by a different author. 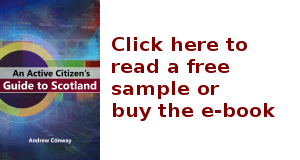 The penultimate chapter contains ten charts from my Active Citizen book which are updated to the latest data available and adapted so that each one can stand on its own with a caption of about 150 words. The aim was, as far as possible, to present the information with a light touch and let the data speak for itself and, I hope, let the reader come to their own, tentative conclusions. I've not yet read the entire book but a glance at the constellation of contributors impressed me greatly (and made me feel a little like a sixth magnitude interloper). I've had long chats with Gerry and a good chat on the phone with Simon, but at no point did they instruct or lead me. Quite the reverse. They let me decide what I should contribute. I'm sure this was true of all contributors. You can order A Nation Changed? from Luath Press or a take a sneak peek at parts of it on Google Books. Below is a list of links which will grow in coming days as I add links to all sources and spreadsheets that show my working. I'll be most grateful if you alert me to any errors, either in the comments here, or else to @mcnalu on twitter.